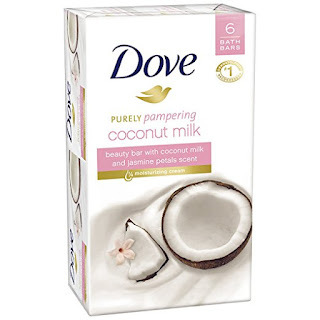 Head over to get this Dove Purely Pampering Coconut Milk 4oz Beauty Bars 6-pack for ONLY $5.54 when you clip the $1 coupon and opt to Subscribe and Save. That makes each of these bars just 92¢ each! Part of the Dove Purely Pampering range, designed to comfort and nourish your skin, this bar brings you coconut milk with the warm, soothing scent of jasmine petals. Dove Purely Pampering Coconut Milk with Jasmine Petals Beauty Bar combines gentle cleansers with 1/4 moisturizing cream and a comforting coconut milk with jasmine scent that leaves you in a state of peaceful tranquility. Just rub your Dove Coconut Milk bar between your wet hands and massage the creamy, rich lather over your skin before rinsing away thoroughly.